See Kate Sew, Shwin Designs, Blank Slate Patterns, and Go To Patterns have come together to create a four pattern collection that can customized for boys and girls called The Alphabet Collection (note this is my affiliate link). It consists of a shirt, vest, pants, and jacket. 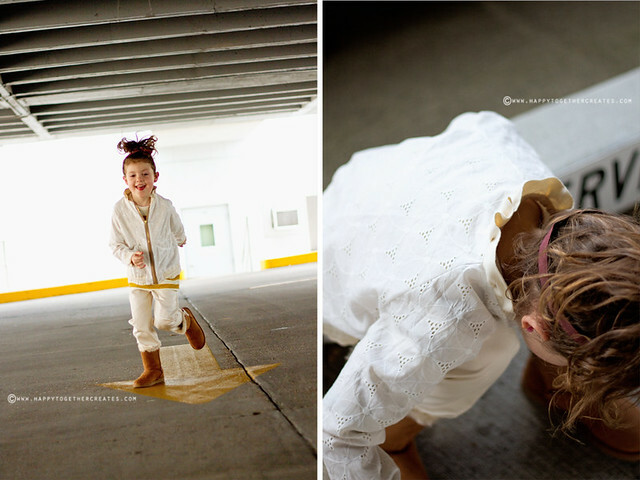 Today I get to share the outfit I made miss J using these patterns. At the end of the post, you can see the list of all the other fabulous bloggers who are on the tour as well to see what they made. But, before we get started on the patterns, I want to share some sponsor love. The girls did an awesome job getting four great sponsors to help us get our outfits made. All of the online shops were really great to work with and are great places to buy fabric/notions from. In the above pic, 1 was all of my goodies from Coats & Clark, 2 was what I got from Organic Cotton Plus, 3 is what I received from Girl Charlee Fabrics, and 4 came from Micheal Levine. The first pattern I made was the Knit Raglan Tee. This was the easiest sew of the patterns and it comes with a bunch of different options. You could make it in a cap sleeve, elbow length (with a band, hem or button), or long sleeves (with a ribbed cuff or button tab option). 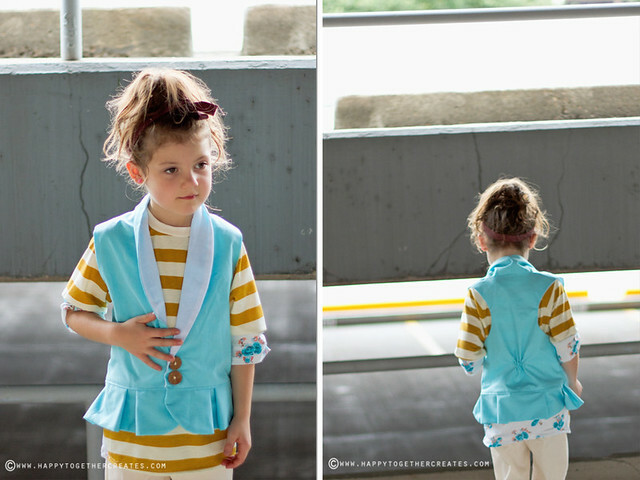 I used fabrics from Girl Charlee to create a short sleeve version with a band. I ended up ruching the band on the edge to scrunch it up some. I could see making a bunch of these shirts with this pattern for my girls. Pattern had great instructions and good sizing. Miss J was giving me a bit of a hard time for pics, so I kind of forgot to get more pics of the pants, but you can see them in most pictures 🙂 This pattern is the W Pants Pattern. They have a slim fit with an inverted back yoke detail. You can kind of see in this picture that back yolk. I was going to use a contrasting fabric there, but the fabric I ordered online was not the color in real life as it was on the screen. It ended up being the same color as the rest of the pants, so I just used all the same fabric and added some embroidery around the yoke instead. Fabric used on these is from Organic Cotton Plus. Other options for these pants are making them with optional zipper close or welt pockets, functioning zipper fly, and shorts or capri length. I went the easy way and negated all zippers 😉 So it was a fairly easy sew. This would be a good pattern to learn to do a zipper fly with. The BBC Vest was another fairly quick sew. I made it in the peplum waist option with a racer back. The pattern comes with ways to make the boys version as well, which could also work for a girl too. I thought the way it’s put together was really great, making it easy to add the lining. I made mine a bit big for J, so I did bring it in some on the side and the front for pictures. I will take this out later when she’s a bit bigger though. I used all fabrics and buttons from Organic Cotton Plus (except the white lining was from my stash). And last, but not least, the Study Hall Jacket Pattern. This was by far the most intense pattern of the group, but it’s worth it. It allows you to create a truly remarkable jacket and looks just like it came from a store. Andrea did an amazing job putting this pattern together. I learned a few things from it too. Some other options that are in the pattern are traditional welt pockets (I added the ruffled welt pocket on this), pockets on the sleeve, a ruffled collar (which is what I used) or a hood. I used fabrics from Micheal Levine for the outer fabric and lining. I wanted it to be on the girly side, so I thought an eyelet fabric would be fun to try. It came out cute and has a great fit. The zipper I used is one from Coats & Clark. 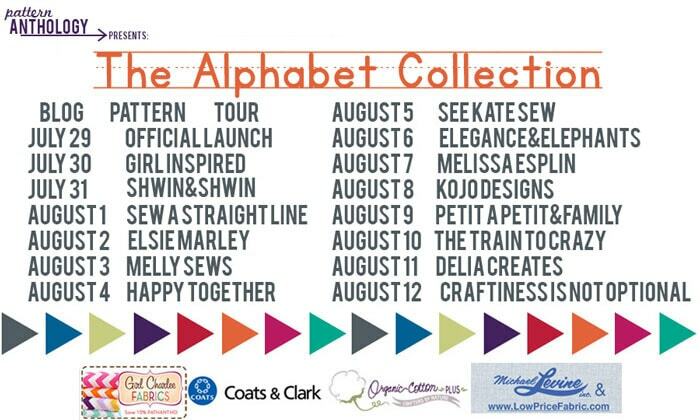 Thank you ladies for letting me be a part of The Alphabet Collection Tour! It was fun getting to make four new pieces of clothing and learn a lot in the process. All patterns are available for purchase here and you can check out the rest of the tour out below. What a great looking outfit! Its fashionable and cute, and just looks comfortable. Nicely done, Jessica! Love the little embroidery details. Gah! Love the colors! Great job. Just bought the patterns, can’t wait to get to work! Gah you are killing me with that eyelet! 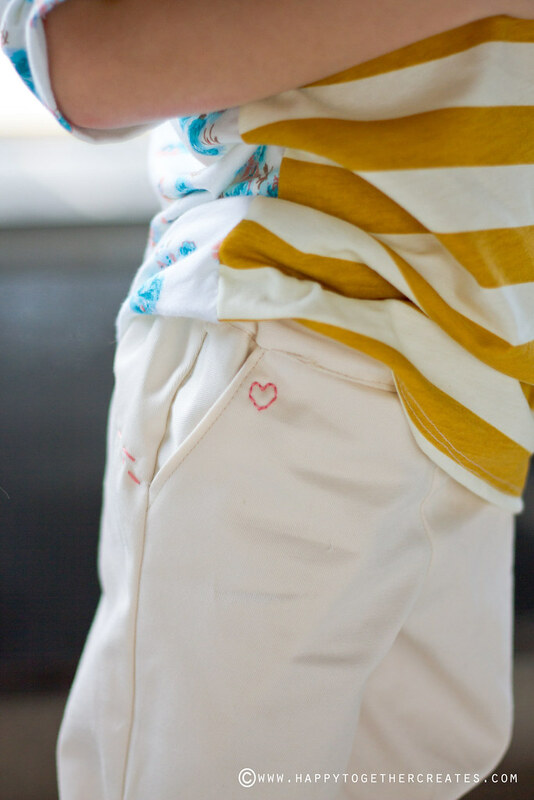 I love how everything has great little details like the little heart on the pants and the color blocking on the the shirt. Also the ruching on the back of the vest?? Darling! You can see all the love in this outfit and it looks so darn cute! Truly a fantastic outfit!! Love how soft and girly it is! Thank you so much for reviewing these! As usual, absolutely STUNNING!! Great job. I love the color palette you went with. That jacket?? What the what! I love LOVE the eyelet. And the mixing of prints is fantastic, too. Nicely done. I am in love with your t-shirt, i am going to have to make one for my daughter ( i hope you don’t mind!). Your color palette and fabric choices are just lovely. Amazing!